The more turbulent version of Japanese crossover finally arrives on the market. The opportunity to do again a point on this Juke in sweatpants. At the top of the range of urban crossover finally arrives RS declination. A strong version of 218 hp at 6000 rev/min for a torque of 280 Nm at 3600 rpm (214 hp and 250 Nm All-Mode 4 × 4-i version), a declined version offers two-wheel drive and differential mechanical sliding or 4 × 4. 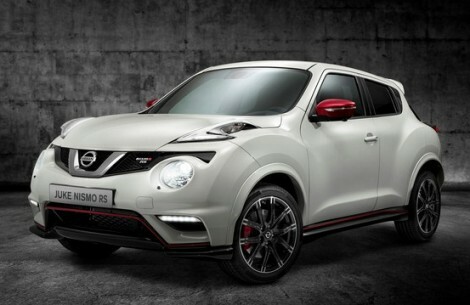 In fact, the Juke Nismo RS inherits a manual six-speed gearbox. Its cousin four-wheel drive adopts for its part Xtronic gearbox, sequential mode to 8 reports and pallets at the wheel. Body and rigidity reinforced, 18″ alloy wheels, bucket seats Nismo, reinforced brake (320 mm front discs), choice of delivered three body (Grey Metallic, Black Pearl and White Lunar) complete the range. Complementary figures: In two-wheel drive (from 27,450 euro): 218 hp, 280 Nm, 7.0s for the 0 to 100 km/h, 220 km/h top speed, 7.2 L/100 km and 162 g/km of CO2. In 4×4 (from 30,750 euro): 214 hp, 250 Nm, 8.0s for the 0 to 100 km/h and 200 km/h top speed, 7.4 L/100 km for 169 g/km of CO2. The first deliveries are imminent.